This locket was awarded to my great-great-great grandmother, Hattie Elizabeth Ingalls, when she graduated from the Southern Masonic Female College at Covington, GA in 1860. 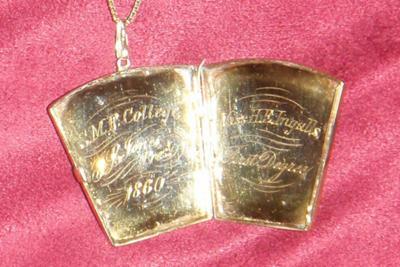 She was 15, and was one of 3 students (out of 10 in her class) to receive a locket for graduating with honors. The locket is more than 14 karat solid gold (not plated), probably 18, although I think my mom told me once that it was 22. At it's widest points, it measures just over 1" x 1". The face of the locket shows a beehive with bees buzzing around it, and has a double border around the edges. 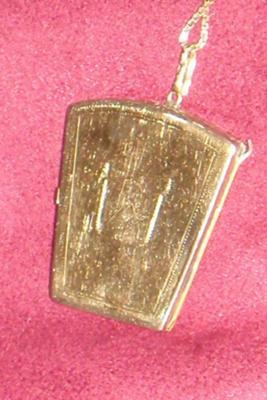 The back of the locket has the same border, but shows a masonic apron (lambskin) with the Square and Compass in the large portion and the all seeing eye in the upper portion. This locket has been handed down to the eldest daughter for generations. I would never part with it, but am curious as to whether other such lockets exist and what it's value might be. We all have worn it proudly, so it is a bit scratched. What an heirloom piece this Masonic locket is! Does anyone else have one like it or similar? My maternal grandmother, Leila Cebell Pace, attended this college. Her parents were W.H.C. Pace and Cebell Matthews Carr Pace, and he operated a general mercantile store in Covington. I do not know whether my grandmother graduated or not, but so far as I know, she never had a locket like this one. She taught school and married Thomas K. Orr and moved to Arkansas. She was killed in 1936 when a tornado destroyed the home where she lived. near Lockesburg, Arkansas. 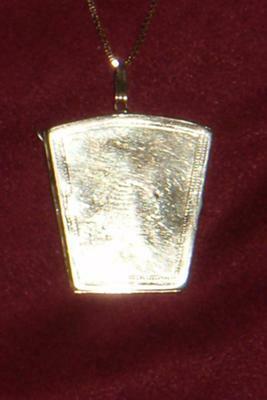 This heirloom Masonic locket is a neat piece, as I have not seen one before. Judging by the condition, I would say it is worth around $600. Very cool, keep it in the family.